Delocalized electricity generators, usually consisting of renewable energy sources, are becoming more and more common. In order to reasonably estimate the load of the grid, the electric network is simulated with an appropriate model including the all energy sources and users. Such a simulation can become particullary difficult, given the increasing number of the delocalized renovable energy sources, in particular with relation to their temporal fluctuation. Normally the many different possible senarios are estimated through a Monte Carlo Simulation (MCS). Given the complexity of the problem and the high number of variables a MCS can be unfeasable in an acceptable time frame. Exact results are calculated running the correct model only for the relevant quantiles. According to this method, the time needed for a simulation is drastically reduced. Despite the approximation, the obtained results are highly accurate. The invention can be implemented in a software dedicated to the design of distribution grids. The mathematical model is extremely flexible and can be applied to the design of small and big distribution grids as well. The model has been tested for different scenarios, leading in any of the analysed cases to reliable results and always showing drastically reduced computational time. 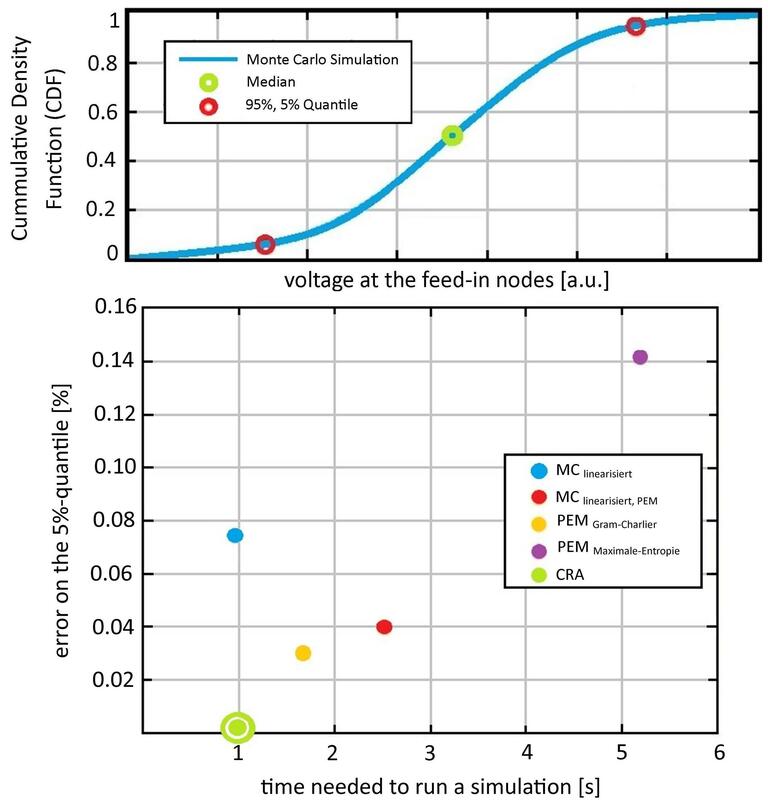 Comparison between CRA and MCS: (upper graph) commulative density function (CDF) of the nodal volatge varying the active power of the delocalized energy sources; (lower graph) comparison of the time needed to run a simulation. The time needed for a complete MCS was ca. 225 s, while CRA calculation can be run in less than 1 s. Pictures adapted from (1).